Zenith SA is a Swiss luxury watchmaker. The company was started in 1865 by Georges Favre-Jacot at the age of 22, in Le Locle in the canton of Neuchâtel. Zenith was purchased by LVMH in November 1999, becoming one of several brands in its watch and jewelry division, which includes TAG Heuer and Hublot. Julien Tornare is the current CEO after Jean-Claude Biver (Interim CEO) in 2017, replacing CEO Aldo Magada, who had replaced Jean-Frédéric Dufour in 2014. Zenith is one of the Swiss watch manufacturers that still produce their own movements in-house. This superb and exquisite "Hy Moser & Cie" Solid Gold Men’s Pocket Watch with Chain and Fob in absolutely mint condition is a truly rare find for the unique pocket watch lovers and, especially, the rare antique Swiss “International Watch Company (IWC)” Schaffhausen collectors! Manufactured in Switzerland by one of the most famous watchmakers, the originator of the International Watch Co. and the official supplier of watches to the Russian Imperial court, Henry Moser in ca. 1887-1890, this particular model is considered as one of the firm's best and qualitative models. This unique pocket watch is still preserved in excellent condition in its original wooden box, lined in silk with the inscription in pre-revolutionary Russian alphabet on the cover: "Г. МОЗЕРЪ и Ко. в Москвъ" ("H. Moser and Co. in Moscow"). The watch is in perfect working order, and looks like it was probably never used - winds smoothly and runs fine with a great motion. A very good time keeper! With the original watch-hands and crystal glass in absolutely mint condition, clean and bright, all covers closing tight and open properly. No dings or dents, scratches or imperfections are found anywhere. The full Hunter Case is made of 56° (14K) Rose Gold and has a Serial No. 90206. This watch has one frontal and two rear covers, external and internal. The presence of the inner lid is a good sign of a high quality watch and is used to protect the mechanism from dust, as well as providing added protection from moisture. Both, the frontal and the upper rear covers display machined decorations and are inscripted “Hy Moser & Cie” and hallmarked .The solid gold inner lid also bears the following inscriptions: “Hy Moser & Cie”, "15 Rubies", "Echappement a Ancre", "Qualite Salter" and Serial No. 90206. The watch measures: 53 mm across and 73 mm, including crown. Thickness: 14mm. Weight: 64.14dwt (98.9g). The 15-Jewel pin-set nickel movement has a lever escapement and anchor-style layout. The white porcelain dial features Roman numerals and is signed “Hy Moser & Cie.” The smaller stopwatch dial, located at the bottom of the main watch dial, features Arabic numerals. The original, intricately woven chain measures approximately 12" long and is also made of 56° (14K) Rose Gold, and has the most unusual fob - the1899 Imperial Russian 10 Rubles coin. The coin (56°/14K) contains .2489 of a troy ounce of gold and features on one side the profile of the last Czar of Russia, Nichols II and the Russian Imperial coat of arms with the double-headed Imperial eagle on the other side, along with the date, 1899. While the coin was worth 10 Roubles when it was manufactured, it still continues to grow in value due to its age, rarity and very high gold purity level (900 gold content). The coin alone weighs 8.6g (5.57dwt) and measures 22.5mm in diameter. 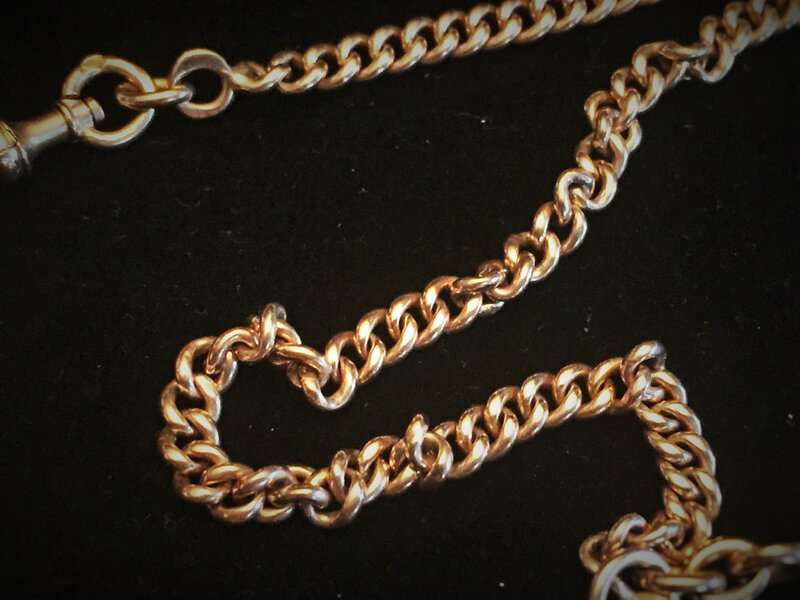 The total combined weight of the chain and fob is 33.8g (21.9dwt). Johann Heinrich Moser was born and grew up in Schaffhausen in the traditions and experience of a watch making dynasty that had become established over the generations. Son and grandson of watchmakers, he learned the traditional watchmaker’s craft from his father, Erhard Moser and from his grandfather Johannes Moser. In 1824, he left Schaffhausen to set up in Le Locle, where he perfected his knowledge in the presence of the greatest watchmakers of the time. Two years later, he tried to return and set up business in his home town, but the Municipal Council rejected his request to be given the honorary post of watchmaker to the town in favor of someone else. Heinrich Moser & Co. came into being in 1828 and in 1829, Johann Heinrich Moser founded his watch making business in Locle to manufacture pocket watches. As an ambitious and visionary watchmaker, Johann Heinrich Moser decided to set up in business in Russia. Tsarist Russia at the time was regarded as an excellent labor and sales market and as a sound trading base for watches. After several employed positions as a watchmaker, he founded his own company in St. Petersburg at the end of 1828. This marked the hour of inception of the greatly successful brand, Hy Moser & Cie. Alongside precision watches and watches designed as pieces of jewelers, Johann Heinrich Moser also offered a range of simple watches. As he built up his trading network, he came to realize that a successful wholesaler should also be a manufacturer. Johann Heinrich Moser accordingly established a watch factory in Le Locle in 1829, which produced watches exclusively for his businesses. This allowed him to guarantee the high quality of his products. Eventually, he was made an honorary citizen of Le Locle in acknowledgement of his services to the town in the Swiss Jura. Johann Heinrich Moser’s constant quest for quality was crowned by success. In 1831, he opened a subsidiary in Moscow, and became supplier to the Tsars, the Royal Families, the Imperial Court and the Russian Army. Within just a few years, he was selling watches to Persia, China, Japan and Turkestan. Johann Heinrich Moser also developed sales of his watches in Siberia and Kamchatka as well as New York and Paris, where his brother George Moser was working as a watchmaker. Only 15 years after starting his company, Johann Heinrich Moser was the undisputed market leader in the Russian watch trade. In 1845, the Johann Heinrich Moser companies in Russia employed around fifty people. Having become a prosperous watchmaker, Johann Heinrich Moser decided to return and settle definitively in his home town of Schaffhausen at the end of 1848 where he had the Charlottenfels castle built. He became one of the key figures in the town, participating actively in its development. The first internationally active company founded by Johann Heinrich Moser was the St. Petersburg trading company, Hy Moser & Co. From this name, he developed the company signature in Latin and in Cyrillic script, which was almost always accompanied by a medallion. Until about 1918, these symbols were the standard signature on all watches supplied by Heinrich Moser’s watch company. In 1829, Johann Heinrich Moser opened a watch factory in le Locle, which also bore the name “Hy Moser & Co.”. The Russian operation had to be abandoned in 1917 in the aftermath of the October Revolution. In about 1920, in Moscow he founded the “Central watch repair workshop” on the ashes of the Moser watch making factories of old Tsarist Russia. For the seventy-year period of the “Soviet Union” Henry Moser watches would remain synonymous with work of a superior quality for the leaders of the eastern bloc. As proof of this, in 1966, the USSR presented one of its high-ranking military staff a Moser pocket watch in 18-carat gold, dating from before 1917 (this collector’s piece has now been bought back by Moser Schaffhausen AG). The name of Henry Moser also died out in this branch of the family in 1923 with the death of Heinrich Moser’s only son, who had no male offsprings. In 2002, Dr. Jürgen Lange and the great-grandson of Johann Heinrich Moser, Roger Nicholas Balsiger, jointly with private investors, founded the watch company Moser Schaffhausen AG. Dr. Lange also registered the original brand H. Moser & Cie again internationally. It was a time of renaissance for the Moser Schaffhausen AG and the reintegration of the Henry Moser lineage. "Henry Moser" watches were so popular and demanded that there were their fakes. Therefore, in trading price-lists of these firms, among the list of addresses of shops, types of watches and the prices for them, there were so-called "Cautions". For example, in the Trading price-list of factory of Moser for March, 1906 it is written, that " for elimination of cases of abusing by some dealers by the name of our firm we consider necessary to recommend wishing to get watches of our factory to pay special attention on that - whether it is placed on offered watches per brands available on them and inscriptions in French before a surname "MOSER & Ce" letters "Hy", as only with such brands and inscriptions watches are really products sew factories". These cautions are useful and to modern collectors of watches, as well. Today, Roger Nicholas Balsiger, great grandson of Johann Heinrich Moser, heads the company’s administrative council as its honorary president. In the autumn of 2005, for the 200th anniversary of its founder, the company reappeared on the international watch making scene. The base of the clock is stamped with the artist name: "Max Blondat" and carries a Valsuani foundry stamp with “CIRE at the top "PERDUE" at bottom (Cire Perdue is French for lost wax casting), as well as copyright symbol and date "02.1914". The clock is in excellent antique condition constituent with age. It is rare to find a stunning work of art of museum quality and craftsmanship, such as this beautiful and important bronze sculptural timepiece. Like all Max Blondat's sculptural compositions, this one also features the originality and allegory of a specific theme. In this particular case it is unrequited love. 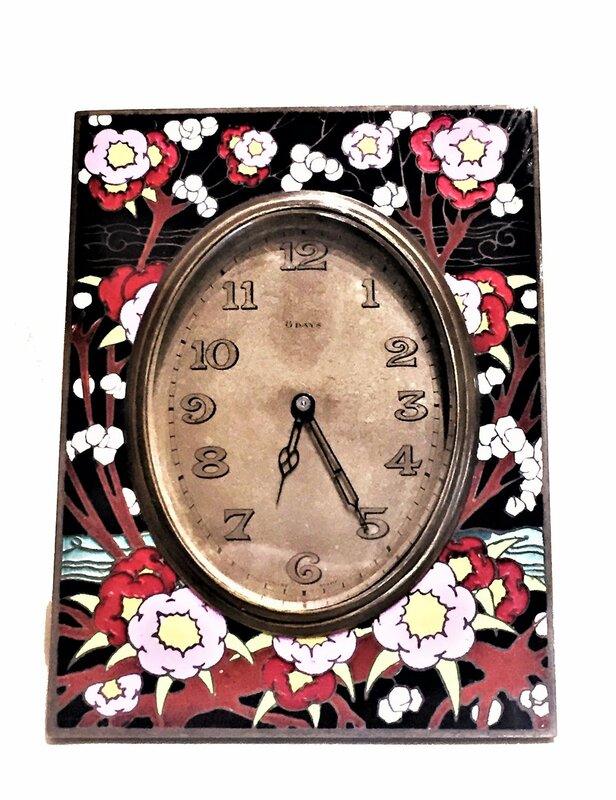 The body of the clock is made in the form of a luscious three-dimensional heart embroidered with flowers. In the center of the front part a clockwork with porcelain face and enameled hour hands are mounted. There are several feathers of arrows piercing the bronze frame dial by the upper part of the perimeter, indicating the repeated unsuccessful attempts of the stubborn lover to succeed in this field with his impregnable vis-à-vis, who does not at all want to respond to loving appeals with reciprocity. In the foreground, a charming chubby Cupid bent down in thought and apparent helplessness. Having lost all hope and lowering his bow, he holds in his hand a broken arrow, the second fragment of which is lying under his feet. And, while he is frozen in thought, time passes and the clock is ticking! Naturally, the observer has a question: "And how, in fact, does this sad unrequited love story end? Will Cupid achieve desired reciprocity over time and, showing constant perseverance, break inaccessibility?" Looking at the cover in the form of several crossed arrows, defending the clockwork at the back of the clock very reliably, the answer to this question arises by itself - and, this answer is "No!". Maximilian, or Max Blondat was a French sculptor of Art Nouveau and Art Deco styles. One of his most famous sculptures is the Fountain of Youth, representing three children watching three frogs. Copies are at the Place Darcy in Fontainebleau; Düsseldorf, Germany; Buenos Aires, Argentina; Ukraine, Odessa; Zurich, Switzerland, and the United States in Denver. He was the son of a copper worker. He was apprenticed to an ornamentalist sculptor in 1886 and continued over the sculpture work in many areas and different materials. Blondat arrived in Paris and began his studies in 1889 at the Ecole Germain Pilon. In 1890, he exhibited at the Salon of French artists for the first time and presented a plaster medallion, then perfected in the workshop of Mathurin Moreau . In 1892 , he entered the École des Beaux-Arts in Paris. During that period, Max Blondat signed his first achievements using the maternal family name Henry. His works can be found in wood, stone, clay, glass, bronze, and he excelled in the decorative arts with the reduction of his sculptures and the creation of small utilitarian objects: car radiator caps, knockers, clocks, pockets, ashtrays ... He also produced ceramics with Edmond Lachenal AT the Sèvres manufactory, and worked extensively with wrought iron with Edgar Brandt . His bronzes had been cast by the Siot-Decauville and Valsuani foundries . Blondat also created jewelry for Chambon and Hermes . In 1906, he became a founding member of the Society of French Decorative Arts . Part of his work is on display at the Museum of the 1930's in Boulogne-Billancourt . One of his most famous creations is the Fountain of Youth, representing three children observing three frogs. The exact copies of the fountain can be seen in Dijon Darcy, Fontainebleau, as well as in Dusseldorf , Germany; Buenos Aires, Argentina; Odessa, Ukraine; Zurich, Switzerland; Zurich, Switzerland; and Denver, United States. Engaged in the service of camouflage (the Chameleon) which he left in 1917 for becoming a head of the École des Beaux-Arts in Dijon, where he served until 1919. He then got carried away by creation of the WWI memorials. Maximilian Blondat was decorated with the Cross of War (WWI, 1914-1918) and made an officer of the Legion of Honour in 1925. Max Blondat lived in the neighborhood of the Parc des Princes in Boulogne-Billancourt, a city which gave his name to one of its streets. A street in a small French town of Auxerre bears his name, as well. The world-famous Valsuani foundry was started by the Italian brothers Claude and Attilio Valsuani who learned the foundry trade while employed at the famous Hébrard art foundry. While working for Hébrard, Claude Valsuani showed great promise as a finisher and eventually worked his way up to become the Technical Director of the Hébrard foundry. In 1899 Claude Valsuani started his own foundry in Châtillon, casting mostly small works for various artists primarily using the lost wax technique of casting (cire perdue). In 1905 he moved his foundry to 74, rue des Plantes in Paris. Among the better known sculptors who had the Valsuani foundry cast their works were: Degas, Rodin, Renoir, Gauguin, Maillol, Picasso, Modigliani, Matisse, Giacometti, Brancusi. Ossip Zadkine also used this foundry for the casting of his sculptures. Thus, the Valsuani foundry quickly acquired a great reputation, particularly for its outstanding mastery of lost wax casting. Claude Valsuani was also celebrated for the beautiful patinas he created with a blowtorch, a technique imported from Italy which, as he said, did not leave any deposit of carbon and gave the sculptures a beautiful glossy aspect. One of the foundry’s most famous patinas until now is called the Noir de Valsuani (Valsuani black). Last but not least, Claude Valsuani was among the first casters to fight against counterfeiting and unauthorized editions by marking each sculpture with the total number of casts in a series, as part of his numerical notation (eg. 1/10).. Claude Valsuani died in 1923 in his native Italy, but his son, Marcele, took over the running of the foundry and continued to produce extremely fine detailed bronzes until the 1970's.